Imagine a world where man and machine are blended, allowing you to open doors or start your car simply with the wave of your hand. That vision of the future has taken a step closer to reality, thanks to implantable microchips that can communicate with locks and other devices. 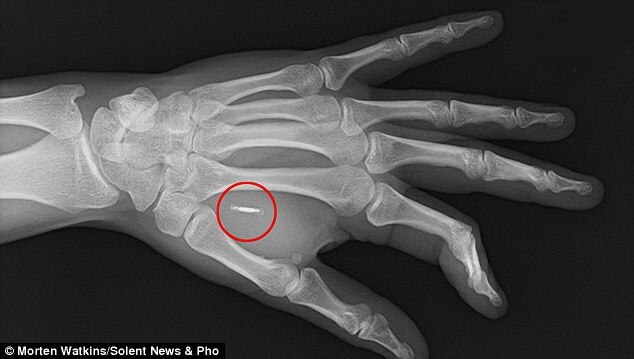 Inventor Steven Northam, from Hampshire, is among those who have adopted the cyborg practice, having an RFID chip inserted under his skin. Although his wife is not entirely comfortable with the technology, he says he hopes that his baby daughter will one day follow in his footsteps. Mr. Northam, from Otterbourne, has one of the chips in his left hand, which allows him easy access to his home and office. The 33-year-old had the device, the size of a grain of rice, implanted between his thumb and finger to make his life easier. It took around a day for the locks to be changed, at a price of about £300 ($400) for each. The married father of one also has the technology fitted to his BMW Z4, which starts when his hand is on the wheel. Meanwhile his primary school teacher wife Becci, 30, has chosen to forgo the procedure. Instead, she uses an electronic fob to get into their home. About her decision, Mr Northam said: 'She's a bit scared of needles. It's out of choice. 'She's not interested in it, so she has a normal key fob to get in the house. The couple have a ten-month-old daughter called Poppy, who might one day also sport one of the chips.